The Pig and the Pearl just opened at Atlantic Station last week, and we checked it out while my dad was passing through town. I’m pretty sure I’m still full from that meal almost a week later. Chef Todd Richards (of The Shed at Glenwood) has created a really enticing menu, filled with all things smoked, as well as raw and smoked seafood. He even stopped by our table to ask how our experience was, which was a nice touch. I think we were a little overzealous in our ordering, as we ended up with 5 starters… for 4 people. But we really enjoyed everything we tried: Pimiento Cheese Croquettes, Brunswick Stew “Pot Pie,” Rib Tips ‘n Grits, and raw oysters. The plating and presentation was beautiful with every dish. 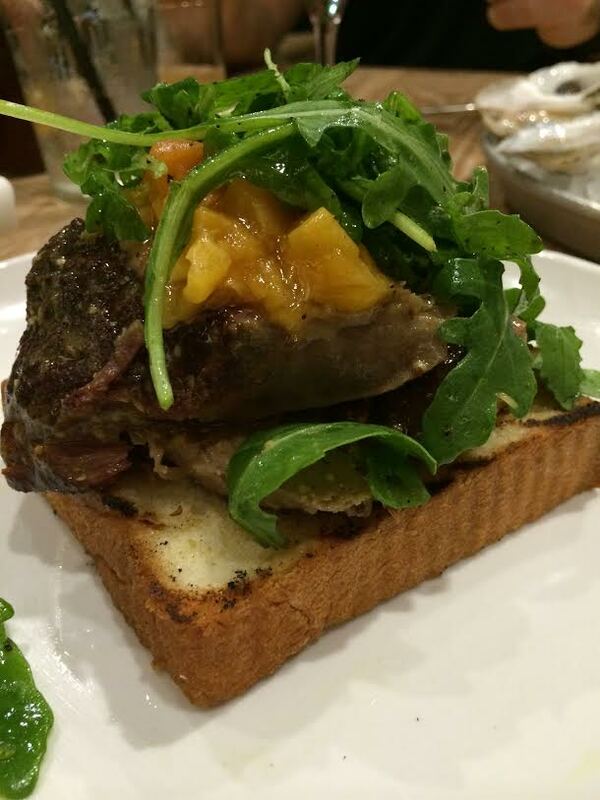 For dinner, I chose the Knife & Fork Pork Shoulder Sandwich, piled high with pickled peaches and arugula. Other dishes at the table were the Spare Ribs and the Knife & Fork Brisket Sandwich. 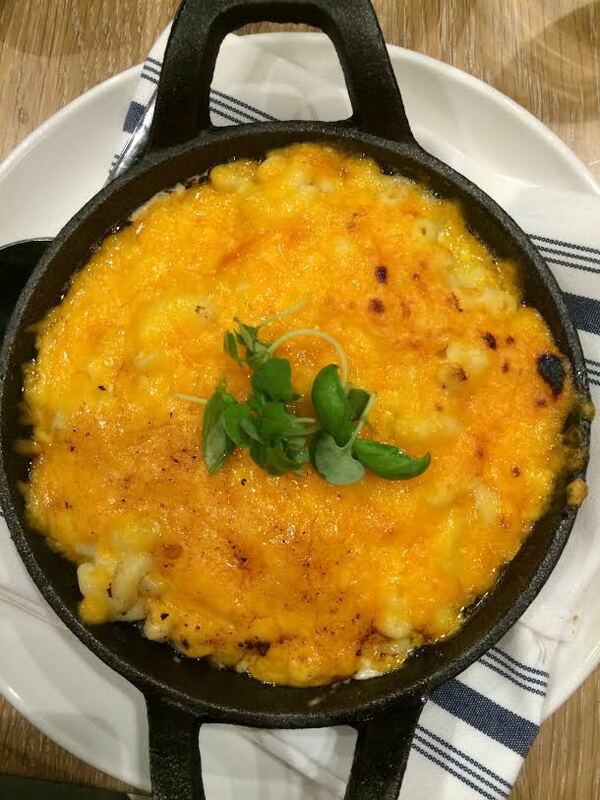 We also shared sides of Smoked Cheddar Mac n Cheese (with double cream, of course), Creamed Corn, and BBQ Red Peas. All were delicious, especially the ribs, brisket, and the sides. My pork shoulder was very heavy on the fat, which I absolutely do not like, but the non-fatty pieces were quite good. 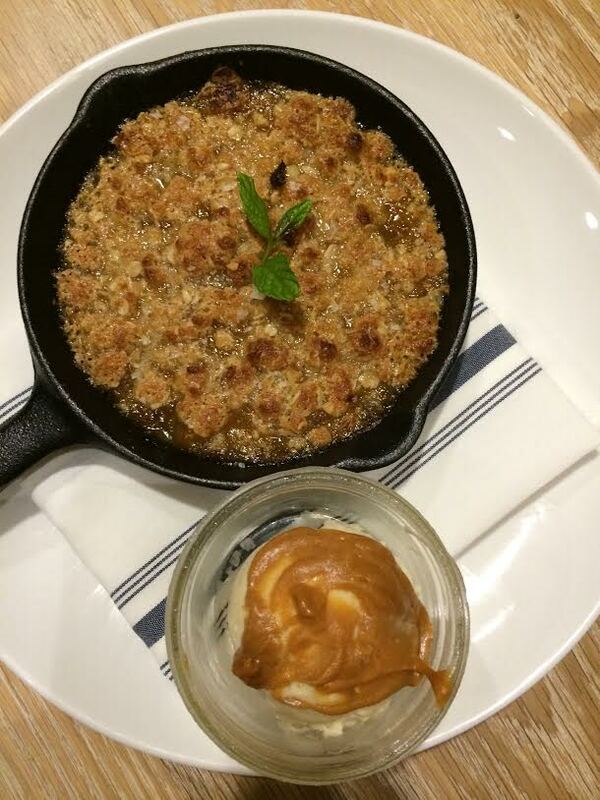 this peach crumble wasn’t on the online menu, and I can’t remember the exact name or ingredients, but it was divine. That coconut ice cream was the perfect accompaniment. Not pictured are the Frozen Jars — a trio of homemade key lime sorbet, chocolate ice cream, and peanut brittle ice cream in mason jars, as well as an assortment of the chef’s confections. I was really surprised at how well-run the restaurant was for having been open less than a week at that point. The servers were incredibly attentive, and the food was delicious. It’s nice to see an interesting addition to the dining options at Atlantic Station!